Working with metal can be a rewarding experience if you have the skills necessary to craft items out of metal or the knowledge to repair metal objects. Whatever your skill or knowledge level is, you will need the proper tools to create the best results. 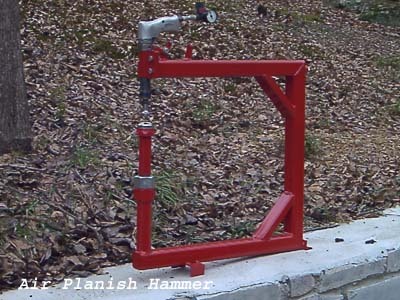 A planishing hammer is one tool that can bring your metal working to a new level. I have listed this information below to help anyone who wants to build their own planishing hammer. 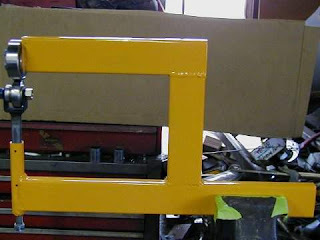 I just came across a great home welding and fab project. This benchtop english wheel plan can save you lots of dollars but also give you more experience fabricating and welding metal tubing,bar togather. Check it out. On the following pages your will find detailed instructions on the parts needed and assembly instructions for a 12" Benchtop English Wheel. The idea behind this exercise is to build a small English wheel that can be held in a vise, and used to fabricate small patch panels for body repair or modification. The goal was to have the lowest price possible, and use parts that were easily obtainable most everywhere. For the top wheel, we used a Ford rear axle bearing, used by Ford from 49 until the late 80's. common and cheap. Any similar bearing can be used, it must be a sealed bearing. For the anvil we used a 1" self aligning bearing obtained from Tractor Supply. Similar bearings are used in pillow block, again it must be a sealed bearing, if it is drilled for greasing it will mark the work. For optimum use, a flat about .075 should be sanded on the center of the outer race, and blended into the radius. The other parts was scrap laying around the shop, left over from other projects. Other materials can be used depending on what you have on hand. Adjust dimensions accordingly. The adjusting mechanism for the lower anvil is a telescoping shaft from a steering column, or intermediate shaft, the brand isn't important, they have been used at one time or another in most makes. Using the wheel will take some practice. The pressure required is not much, finger tight is enough in most cases. I tried it by setting the lower anvil so it just didn't touch the upper wheel, and it did a good job of shaping 18 ga CR steel at that setting. With care, it will wheel 16 ga., or aluminum up to about .060. The use of a sand or shot bag will speed up the process, rough form the part on a bag, using a rounded mallet and smooth it in the wheel. You can get pretty aggressive on the bag, and smooth out the lumps with the wheel. Click here to get the rest of build and plans. With the Christmas season just around the corner, I felt it a good idea to show these hitch covers, my friend Johnny custom fabricates. He is a local Austin metal craftsman that can custom fabricate anything from these hitch covers, to full blown BBQ pits. 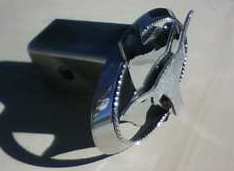 This receiver hitch cover is made of 100% stainless steel and fits all 2" receivers, it was created using a plasma cut Texas Longhorn, Texas shape, Oval Ring and Stainless wire rope edging. This is one fine item and the pic's I posted below doesn't do justice, to the fine quality and detail he used in this creation. He will be selling for Christmas gifts and I will have a link below to purchase with pay pal. 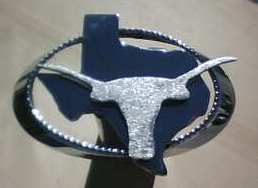 The hitch cover is 3 dimensional longhorn that stands 1/8 inch in front of Texas shape then they are attached to the oval ring using his tig welder. 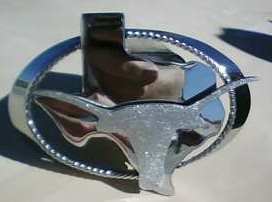 The Longhorn shape is a matte finish, all other pieces are polished to mirror finish. He makes the stainless steel rope trim himself and that makes the design pop out. Just wanted to promote projects created by other native Texans. If you purchase one of these custom hitch covers you can feel good that your funds are going to a American hand crafted product with no imported items used. Please feel free to contact me with any questions. I was recently surfing the net and came across a site for custom fire bowls. Thought I would share these, if you like the outdoors these are great and can be had easily. Check out more info here http://www.johntunger.com/ . John is a very good artist and has created these finje art pieces. A few pics to show here. I know it's been a while since last post. Have been working on other non fabrication projects. Will continue the build up of the drop down seat Honda 750 Chopper soon!!!!! Thanks for your visit.